Both ACE and ATUC have acknowledged the value of holding this joint meeting between ATUC and ACE to address emerging issues, build trust and put forward common positions to the ASEAN Committee on the Implementation of the Declaration on the Protection and Promotion of the Rights of Migrant Workers (ACMW) and Senior Labour Officials Meeting (SLOM). The ASEAN TRIANGLE Project (ATP) aims to protect and promote the rights of migrant workers in the region through increased legal and safe migration and improved labour protection. The Project promotes bilateral and regional approaches to deal with shared concerns, make regionalism more effective, and enhance the capacity of institutions in ASEAN. The role of social partners in effective governance of labour migration is widely acknowledged within ASEAN; however, their capacity to jointly contribute to policy dialouge has been limited. The Project has therefore sought to enhance cooperation between and among workers’ and employers’ organizations, and developed tools and provided guidance for them to be more active in policy dialogue and in the protection of the rights of migrant workers. In doing so, the ATP has developed three year work programs with both the ASEAN Confederation of Employers (ACE) and the ASEAN Trade Union Council (ATUC). However, no joint activities have been undertaken, and the interaction between ACE and ATUC has been confined to regional technical meetings supported by ATP. 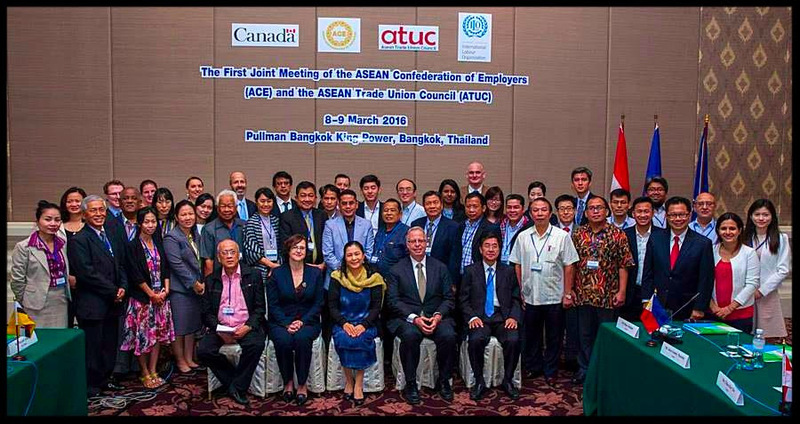 Both ACE and ATUC have acknolwedged the value of holding a joint meeting between them to address emerging issues, build trust and put forward common positions to the ASEAN Committee on the Implementation of the Declaration on the Protection and Promotion of the Rights of Migrant Workers (ACMW) and Senior Labour Officials Meeting (SLOM). At present, there is minimal communication between ACE and ATUC, and as regional groupings of social partners, it is important that they have an opportunity to meet on a regular basis and better understand each other’s work.